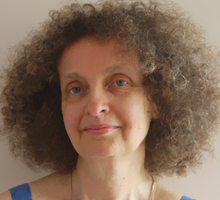 Ruth Kessler was born in Poland, emigrated to Israel as a child, and later moved to the United States to finish a graduate degree in English literature. She’s proficient in more than three languages, and publishes translations and short-fiction as well as poetry. The fact that she does literary writing -- particularly poetry, with its associative nuances -- in a language acquired later in life, makes her work that much more impressive. In the work one finds a richness of imagery and pattern, a fine lyrical imagination, and the cosmopolitan sensibility and erudition of a woman who has traveled and read extensively. At the same time, perhaps because her first experience of travel came as part of the cultural displacement of many Polish Jews, Ruth Kessler’s writing often explores a sense of geographical and spiritual homelessness -- or perhaps better to say the faithlessness of certain kinds of knowledge. One of the poets that Ruth Kessler most admires is Rilke. “Works of art are of an infinite loneliness,” he said, and again, “here there is no place that does not see you.” To conflate the two statements brings me close to certain ground that I find in Ruth Kessler’s poems -- first, a sense of exile or homelessness, and second, a sense that in the work of art, in the poem as it expresses an existential position, one is vulnerable both to mystery and to scrutiny. More often in Ruth Kessler’s poems this scrutiny arises not from the eyes of others, but from the “eyes” of the natural world; and between us and the things which share existence, there is only shared estrangement. of gold at day’s end. the rain leaves us as a farewell gift after its lifting. The sight of a doe gracing the path after days and days of waiting.